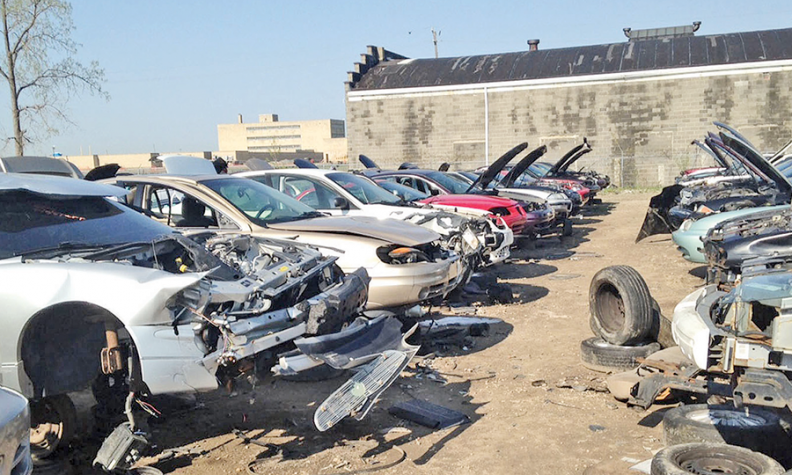 Is danger lurking in junkyards? Junkyards are selling potentially unsafe Takata airbags. At left is a 2003 Honda Civic in a Detroit yard, with the airbags removed. WASHINGTON -- American Honda estimates that more than 24,000 recalled airbag modules made by Takata are scattered among thousands of salvage yards and auto recyclers across the country. The company is scrambling to make sure none of them ends up back on the road. In recent months, Honda has been reaching out to these businesses with an offer to buy any Takata airbag inflators covered by the recalls. American Honda spokesman Chris Martin says the automaker has bought about 3,900 so far and is storing them in a safe location. The effort casts a spotlight on a murky segment of the automotive supply chain and a weak spot in the nation's recall system: scrapped vehicles that are a common source of inexpensive replacement parts used by independent repair shops and wrench-savvy consumers, especially for fixing older vehicles. 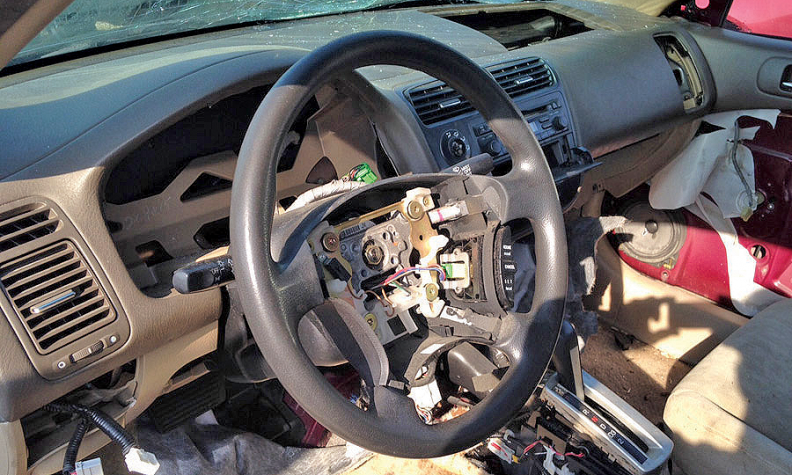 At one Detroit-area salvage yard, for example, undeployed driver- or passenger-side airbags were available for $27.99 apiece to anyone who could detach the part from the damaged vehicle. Federal regulations prohibit the sale of defective used auto parts for repairs. But the regulations are largely unenforced and unenforceable, Michael Brooks, a staff attorney at the Center for Auto Safety says, meaning that it's up to the thousands of salvage yard operators to police their own inventories and keep unsafe parts from being reinstalled. "For NHTSA to be able to enforce that kind of provision I think is next to impossible," Brooks said. "I just don't see how they could track the parts." That challenge was a major reason General Motors expanded its ignition switch recalls in March 2014 to 2.2 million cars, including newer vehicles that were built with the corrected switch. The company was concerned that older faulty switches may have been reintroduced into these vehicles as replacement parts during repairs. "Because it is not feasible to track down all the parts, the company is taking the extraordinary step of recalling 824,000 more vehicles in the U.S. to ensure that every car has a current ignition switch," GM said in a statement at the time. As for the Takata airbags, the National Highway Traffic Safety Administration says it's working on the issue. "NHTSA has two goals here: We want to ensure that defective airbag inflators stay off the road, and we want to ensure that inflators are available for investigation and testing," agency spokesman Gordon Trowbridge said. "We're talking with the recyclers and with automakers to make sure they are working toward those goals." Auto recycling industry players have tried to curb sales of the recalled airbags, but the airbags are still easily available for purchase online, complicating Honda's efforts to keep those parts out of circulation. For example, at HollanderParts.com, a marketplace for recycled parts, a search for passenger-side airbags from 2004 Honda Civic sedans -- a part covered by Honda service campaigns to replace the airbags in high-humidity regions -- found several listed for sale. A check of vehicle identification numbers from the donor vehicles of those parts indicated the vehicles had recalls outstanding for passenger-side airbags. Also complicating Honda's efforts is a lawsuit filed by the Automotive Recyclers Association against Takata and automakers involved in the recall. The trade group's suit alleges that Takata failed to disclose that its airbags were defective. It seeks class-action status on behalf of association members who the group says overpaid for vehicles containing the recalled Takata airbags. The suit is pending in a U.S. District Court in Florida that is overseeing the dozens of product-liability cases against Takata. The trade group recently sent its members a memo saying it couldn't recommend participation in Honda's buyback program because it didn't know how doing so would affect their claims in the suit. A subsequent Automotive Recyclers Association inquiry concluded that the program wasn't subject to court supervision, Michael Wilson, CEO of the group, wrote in an email to Automotive News late last week. Wilson added: "The buyback program appears to be offering recyclers a price for airbags materially lower than the fair parts value." The group has called for automakers to make more parts data available to recyclers to prevent the inadvertent sale of recalled parts. "Access to OEM part numbers and other identifying parts information is critical to supply chain management," Wilson wrote. In this Detroit junkyard, passenger airbags are available to anyone who can detach them from the vehicle for $27.99 each. So far, salvage yards have been cooperating with Honda's buyback effort, Martin said. "Should this situation change as a result of actions taken by the ARA, Honda will take the appropriate steps necessary to continue this important effort," he said in a statement. To coordinate its buyback and track down recalled salvage parts, Honda hired Rebuilders Automotive Supply, a company that operates as an intermediary connecting recyclers and salvage yards with auto rebuilders and parts buyers. Through a standing relationship with Hollander Inc., which provides a software platform for salvage-yard operators, Rebuilders Automotive Supply sent notices to both companies' networks of recyclers and salvage-yard clients -- as well as to sellers listing parts on the HollanderParts.com marketplace and eBay -- alerting them that they may have recalled Takata airbags in stock and that Honda wanted to purchase those parts. The memos said the recalled airbag inflators shouldn't be sold for reuse and described the safety risks posed by the parts, which can explode in a crash and spray vehicle occupants with metal shards. Brandon Mullins, senior product manager at Hollander, said the company's software is equipped to alert recyclers in its network about parts that shouldn't be sold. But ultimately, he said, it's up to individual sellers to decide which parts they list and sell. "Recyclers are in the business of giving safe automotive parts a second life," Mullins said. "As an industry, we are all focused on ensuring we can react quickly to parts recalls."